Vertical Sash - Trade Windows North Devon Ltd.
New houses and flats can get away with styles such as casement and tilt and turn but if you live in a period property or a conservation area, you will know how important it is to maintain the traditional look of your home. With the "Rose Collection" of sliding sash windows, you can enjoy the performance benefits of modern materials without compromising on the authentic features that give your home its classic charm. Maintenance-free - no more sanding or painting, and no more draughty rattling sashes. Energy efficiency - keep your home warm and stop wasting energy with modern, thermally efficient double glazing. All windows in the Rose Collection are 'A' rated as standard. Enhanced security - keep unwanted intruders out with steel reinforced windows with modern high security locks. Improve security even more by choosing our Secured by Design option. Easy to use - modern pre-tensioned balances that are guaranteed not to stick, and inward tilting sashes allowing you to clean the outside of the windows from the inside. Better soundproofing - modern double glazed windows don't just keep the cold and draughts out; they are much more efficient at keeping noise out too. There are three windows in the Rose Collection, designed to suit any kind of home. Charisma Rose - Charisma Rose is ideal for newer properties, as it is the most modern and cost-effective sash window in the range. It is available in a range of colours and finishes, and with a variety of glass, Georgian bar and furniture options, all of which allow you to customise this window to your exact requirements. Heritage Rose - Choose Heritage Rose for the classic charm of timber sash windows but with none of the drawbacks. Heritage Rose was originally developed in consultation with conservations bodies, in order to create a truly traditional looking sash window with all the modern benefits of UPVC. Its deep bottom rail, slim sightlines and authentic exterior putty lines are all characteristic of original timber sashes, which is why no other UPVC sash window can touch it for period authenticity. 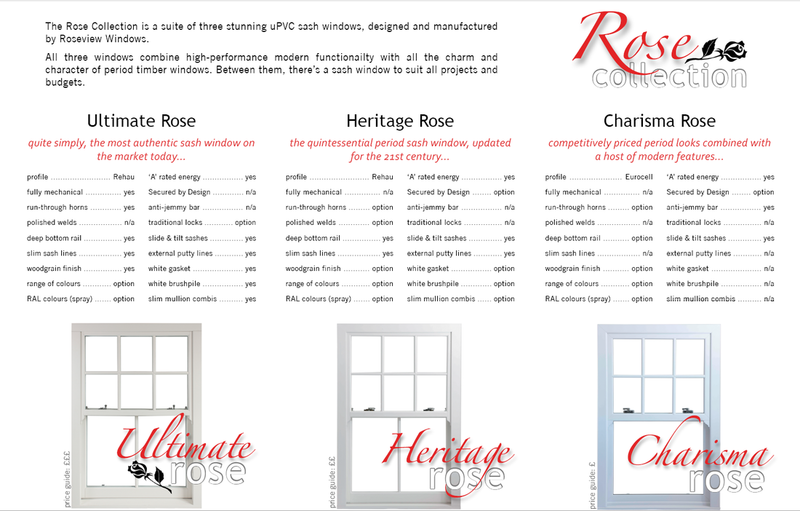 Ultimate Rose - Ultimate Rose is, quite simply, the most authentic UPVC sash window on the market. Based on the Heritage Rose, it adds mechanical joints and run-through horns as standard, and is available in a range of woodgrain finishes. Ultimate Rose is an award-winning window that was designed specifically for heritage and conservation properties, where true authenticity is a must. And this makes Ultimate Rose perfect if you live in a period home but want to upgrade your old windows to something more energy efficient and secure.